TRESemmé may only have been on your radar for the last ten years thanks to an enormous advertising campaign, but the brand has actually been around since the 40s. For most of its life, TRESemmé was only marketed and sold to salons – an attribute that has helped it achieved monumental popularity once it was marketed to the public. TRESemmé now has a very broad product range from shampoos and conditioners to hair brushes and heated hair appliances. TRESemmé profess to be professional salon quality and so you should be able to expect some of the best products on the market. This curling wand is tapered with 32mm at the widest part and 19mm at the end. Having the range of widths allows for a variety of curls and it’s easy to create tight or loose ones. There are three temperature settings on this wand so not as many as some but still means you can have the temperature to suit you. There is a cool tip and it comes with a heat resistant glove and a mat. The glove is alright but other brands do them better; you have to be careful with these ones not to hold the heated wand for long at all. The cool tip is quite large though, so it’s not a big problem. With Advanced Ceramics, this wand seems to heat up evenly and retains its heat well. Oddly, there isn’t an auto shut-off for this tool so you need to be careful about remembering to turn it off. This isn’t a major issue with the product but if you’re forgetful or prone to spending your working day worried about it – then you may need to think twice about buying it. 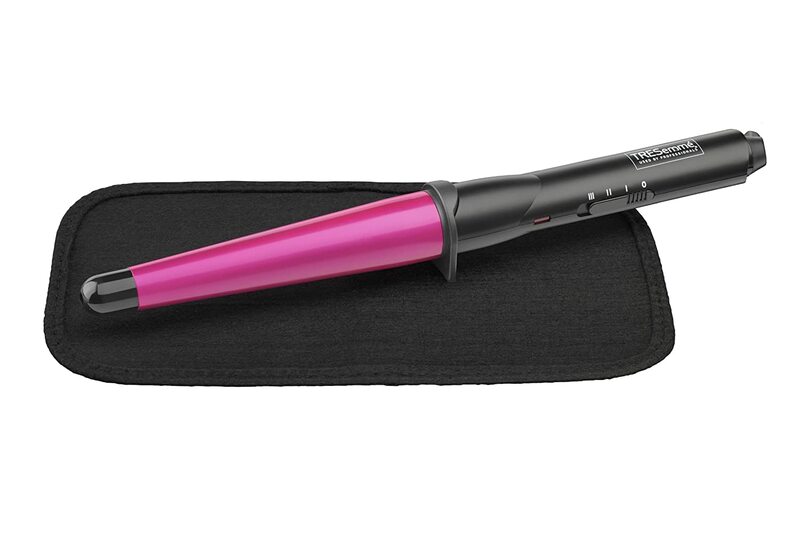 Simple to look at without any gratuitous decoration or glitz, this curler looks good and is a shade of pink that isn’t garish. With a 2.5m swivel cord, it’s a good length for any room and the curls it creates easily last all day. It is really easy to use and creates curls after seconds, with no kinks. This wand is good for those who like a variety of curl sizes and it’s easy to get a natural look fast. It’s a nice addition to your room and isn’t over-the-top girly which is a bonus. The lack of an auto shut-off may play on the minds of some though, even with the heat resistant mat. It has an in-built heat stand to keep the wand off the floor so really, the lack of an auto shut-off isn’t a huge disadvantage but it’s a personal preference. The heat glove does warm up at 200˚C and you can’t hold the wand for long but, again, not a major issue as there’s a good size cool tip and it only takes seconds to curl each section of hair anyway. These are affordable and it’s easy to see them being used in a salon environment. With a 3 year guarantee you shouldn’t have many worries with these and they’re a good choice for great curls.